I don’t know about you, but I’ve always thought about life in terms of an academic calendar. I still find myself saying, “I can’t, it’s a school night,” when I mean work night. Part of that stems, of course, because when children are out of school, our lives take on a different rhythm. Even those without children see it. We don’t have to change our work route to avoid the bus stops, for example. I just read an article about the start of the school year and it made me think about some of the things I need to do to ensure that I’m ready for the next push at work. Perhaps some of these will be helpful to you as well. Check Your Commute. I already mentioned this, but it’s good to know where the bus stops are. 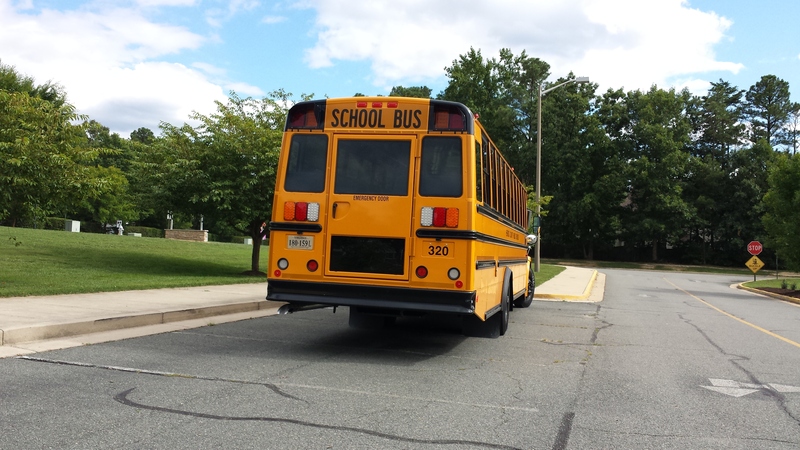 Last year, one of the school buses stopped at my intersection. If I didn’t leave the house by 7:45 a.m. I was going to be stuck for at least 10 minutes. I adjusted accordingly. Stock Up. With chilly days and more opportunities for bad weather, we get a bit lazier about leaving our offices. It’s good to have healthy snacks on hand. I keep a desk drawer filled with granola bars and nuts, and a bowl on my file cabinet with apples. If the healthy food is easily accessible, I will eat it and not go near a vending machine. I also bring in a week’s supply of Greek yogurt and keep it in the fridge. Exercise. In the summer, most of are involved in more outdoor activities that keep us active. Don’t let the shorter days and the busier fall schedule keep you from working out. Take a walk at lunch, meet with a friend on the weekend for a walk or bike ride, join a gym. Schedule Fun. As they days get shorter, it’s all too easy to spend more time at the office because there is not the pull of the outdoors and sunshine. But you still need to take a break and have fun. Be sure to schedule fun, whether it’s dinner out with friends, movie night or a night in with the family. Recalibrate. How are you doing on your career goals? Now is a good time to check your progress and recalibrate as needed. It’s also a good time to look forward and start thinking about next year’s goals. While I’m not ready for summer days to disappear, I am ready for what the fall brings – just as soon as I go to the grocery store and restock my desk drawer! Several months ago, I worked with a colleague to help prepare her for a TEDTalk. She already was a good speaker, but TED requires taking one’s speaking and presentation skills to the next level. Here are some of the things we did to help get her ready, many of which were included in the speaker tool kit that TED provided. The first thing to remember is that when you watch a TEDTalk on YouTube it may look effortless, but there are “hours of thinking, preparing, practicing, slide revising and memorizing involved behind each spectacular talk,” according to the tool kit. We reworked the slides at least three times. Too often in the business world slides are dense with copy and images. For a TEDTalk, less is more. We worked to find a single, strong graphic. The visuals exist to develop the ideas presented in the talk, not to distract from it. The talk underwent at least five formal revisions, not to mention lots of tweaking. The first version was too much like a formal speech. That version, though, allowed up to pull the strong themes out and rework it into a conversational style. Knowing how to begin a talk can be a challenge. Read “The Most Powerful Ways to Start a Presentation” for more tips. Personal examples were included to advance the story and set the tone. The ones we included were powerful and succinct, and not experiences that others in the audience would have had. They set the path to explore the topic more deeply. Practice also was critical since speeches needed to be memorized and needed to stay within the allotted time. We recruited colleagues to serve as audiences on several occasions. During the final practice run when one person was moved to tears, we knew my colleague had nailed it. Do dream big. You want this talk to be the best you have ever given. Don’t read your talk. Use the visuals as prompts and have a few notes to guide you. Be flexible in case you lose your path. Do make the complex simple. Don’t dazzle the audience with busy slides, too many statistics and pompous words. Instead, strive to connect with the audience. Do end your talk on time. It’s rude to steal time from the people that follow you. Do rehearse. This allows you to practice for timing, for clarity and for impact. Identify Your Goals Before you arrive at the conference spend some time reflecting on your professional goals for attending. Conferences are a great way to advance your professional objectives. You can build your network, find a mentor, advance your subject matter expertise, and develop new skills. From a personal standpoint, you could grow your personal brand or make connections with others. Create a Checklist Before you head out the door, be sure you have everything you need. One way to do this is to create a checklist. You will want to take lots of business cards, notebook, pen and laptop or tablet. It’s also good to highlight the sessions you want to attend and make note of individuals with whom you want to connect. Participate If this is your first conference, attend the orientation for new attendees and participate in any specific activities. 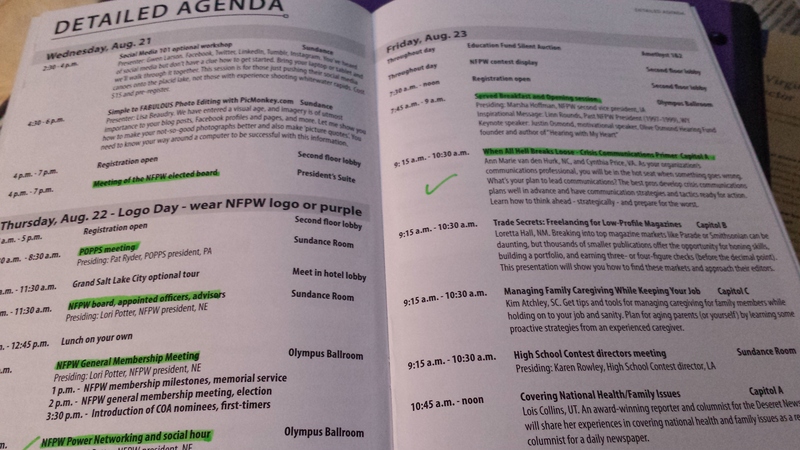 At the NFPW conference, all first-timers wear a ribbon identifying them as such. Long-time attendees are encouraged to seek them out and answer questions they may have. If someone seeks you out, share what your goals are and learn about the hidden gems of that particular conference and how best to navigate it. Venture Into New Territory Attend at least one workshop in an area that you are not familiar with as it might help you discover a new opportunity or at least make you conversant in the topic. Years ago, sitting in a workshop about blogging, I never expected to become a blogger. Yet that session sparked an interest for me. Introduce Yourself and Bring Business Cards Set a goal of introducing yourself to at least three new people each day. Ask them why they are attending and what they hope to get from the conference. If they have attended for several years, ask them what their favorite part is. You will want to have plenty of business cards to distribute so when you meet someone they will have your name, title and contact details. When I receive someone’s business card, I jot a few notes on the card so I can remember our conversation when I return to my office. Also, if I’ve promised to send or share information I make a note of it so that I can do so. I also send LinkedIn requests so additional networking can occur online. Review the Schedule Before the conference begins take some time to review the schedule and speaker bios. Highlight the sessions that you want to attend and make sure that the title aligns with the session description so you aren’t disappointed. Make note of any speakers with whom you would like to have a conversation. I’ve switched sessions after reading a speaker’s bio and realizing they were speaking on a topic that would resonate with me. Tweet If you are learning and networking, and find the conference of value, you can share highlights via social media. Be sure to use the conference hashtag. It’s a great way to connect with those who can’t attend and also to learn more. I’ve been at conferences where the speaker referenced a book but couldn’t recall the author. Within moments, someone in the audience had tweeted the information. You don’t want to tweet to the point that you aren’t paying attention but it forces you to think about the key point you would share – in 140 characters or less. Build in Down Time. Conferences can be exhausting. Networking is hard work. Sleeping in a strange bed can be a challenge. Keeping up with the office creates challenges. While it’s admirable to want to attend every session and network to all hours, you also need to take care of yourself. Be sure to give yourself some down time or catch up on uninterrupted sleep. Take Notes, Bring Conference Highlights Back Not everyone in your office is able to attend so you may want to focus on what you can take back and share with your colleagues. I’ve found that with really good conferences there is so much good information that I create a one- to two-page simple newsletter with highlights, which I then email to colleagues. Another way to share the information is to host a brown bag lunch once you return to your workplace. I also found fodder for my blog. Schedule Follow-Up Following a conference, I’m always reengaged. I have great plans to meet with colleagues and continue the conversations. I schedule the lunches, coffees and phone calls within the first two weeks back; otherwise, I get too caught up in the minutia of my job. If I have follow-up assignments, I try to complete them within a week of returning, if possible. Following-up is a great way to strengthen your professional network. As with any opportunity, what you get from it will be based on what you put into it. If you follow all (or some) of these tips, you will have a conference with a great opportunity for learning, connecting and having fun. I wrote that I had been helping individuals in their job searches. One of the first pieces of advice I give is to update the LinkedIn profile. Use your LinkedIn address in your email signature. That will enable people to click and learn more about you. Edit your profile descriptor as that is what shows up on Google. Most people have it as their current job title. Is that really how you want to be known? This is where you define your personal brand. Share details about you and your company. Position yourself as a thought leader. Post a comment about a trending topic relevant to your field. If you write a blog, post it to LinkedIn. Post jobs on LinkedIn for your company or that you know about. Make it easy to contact Include your email address and phone number and why a person should contact you. Post a photo. People are seven times more likely to look at your profile if you have a photo. People want to know with whom they are dealing. As with any writing, be sure to proof it before you post it. As with anything, it’s also good to know what your goals are for being on LinkedIn. Networking takes time and effort but the rewards can be huge. Face to face meetings. These meetings are usually one-on-one opportunities to get to know a person better or to discuss a particular subject area. I try to hold at least three of these a month. Professional meetings and associations. To further your knowledge within your field, it’s helpful to get involved with groups that focus on your subject matter. I belong to the National Federation of Press Women, Virginia Professional Communicators and the Public Relations Society of America. Monthly and yearly meetings provide me with opportunities to enhance my skills, and the networking provides me opportunities to learn about others and their responsibilities. Conferences. These are a great way to learn new skills and, at the same time, meet with others who face similar challenges. At a recent conference I attended, I spoke with several about pitch ideas. The advice was invaluable. Networking clubs. These groups are a chance to meet individuals from a variety of professions. I don’t belong to one, but I often attend a women’s networking group as a guest. I usually gain some insights into other areas. One time, I met an individual who ran a catering company. A few months later at work I had to organize a day-long meeting that required lunch. I called the individual I had met, and the lunch was a success. Community involvement. I volunteer with my local library. Our shared love of books brings us together, but the individuals come from all professions. I found my tax preparer through the group. I’ve also met teachers, health care professionals and writers. LinkedIn. LinkedIn enables you to build a strong online presence, build your credibility and network. It’s also easily searchable. When I’m hiring individuals, I always review their profiles. When one of the professional groups I was involved in needed a web designer, I posted a notice about it, and I reconnected with a former colleague who now did that work. He’s still managing our website. In my next post, I’ll share some ways you can enhance your LinkedIn profile. Several friends are currently looking for work because of company closings and downsizing. A few friends, who are gainfully employed, have expressed concerns about shaky futures with their company. While none of us can accurately predict the future, we can prepare for it. As someone who handles crisis routinely, I follow certain steps and procedures to ensure readiness. Update your resume. I review my resume at least once a year, and sometimes more. If I join a board, earn an award, add new responsibilities, I update the resume. It’s best to do it when the information is fresh. Maintain a list of companies/dream jobs: You may have a good position at the moment, but if there is a company that you dream of working for, follow it on LinkedIn or routinely check its website. That’s what I did with my most recent position. Keep the list and review it regularly. All of my jobs came when I wasn’t necessarily looking, but I couldn’t pass up the opportunity. Be active on LinkedIn. Speaking of LinkedIn, it’s good to keep your profile updated and to check in at least once a week to review the latest openings in your profession and to see what others are talking about. The top stories often surface during job interviews. It’s also good to share information that would be of interest to others in your network. Network. Years ago a trusted advisor encouraged me to have lunch at least twice a month with individuals within my network. I took that to heart and went so far as to track my efforts and what was discussed until it simply became part of my career habits. I regularly meet with others in my network to share ideas and best practices, to learn what they are doing, to provide connections to others and, yes, sometimes to ask for something. It’s amazing how many people you will meet with in a year if you make this part of your routine. Collect work samples. Keep copies of your output offsite. You don’t want to be scrambling on the last day to find a copy of a great press release you wrote so that you have it to share at a job interview. Be sure to also maintain a list of key contacts away from the office. It’s one of the reasons, I find LinkedIn so valuable – I can always reach someone within my network through LinkedIn even if I can’t immediately find the person’s phone number or email. Reporters using social media for finding stories and fact checking. Ben Sharbaugh, associate director for digital strategy at Harvard University shared at a conference that 50 percent of people hear about news on social media before it’s published anywhere official. Success measured in page views. Copy editing is not a priority at many outlets. Reframe the traditional stories that you pitch. It’s not enough to pitch the story angle. In addition, include sources, photos and video to create a package for the reporter. Expand the types of stories you pitch. This involves finding unique or creative angles. For example, tweeting out what experts are available, especially if you tie it to a big story, can lead to success. Refine the way you write your pitches. Smart recommends focusing on a few outlets and then mass sending to others.